Hydrogen peroxide (“H2O2”) is a powerful oxidizing agent, much more powerful than aeration, chlorine or potassium permanganate. Hydrogen peroxide decomposes into oxygen and water leaving no trace of chemical residues. For problem well water containing iron, iron bacteria, manganese and/or “rotten-egg” sulfur odor “H2S” (hydrogen sulfide gas) hydrogen peroxide systems are an excellent choice. Unlike chlorine (which is either sodium hypochlorite, or calcium hypochlorite) peroxide leaves no salts, metals or chemical residuals. The only disadvantage is that it costs a little more than chlorine bleach. However the reduced maintenance and service calls increases life expectancy of the equipment and Higher Quality Water more than offsets the cost. For many applications no contact tank is required, and the hydrogen peroxide is effectively removed by the catalytic carbon media. Enjoy clean, crystal clear water with a Hydrogen Peroxide Well. 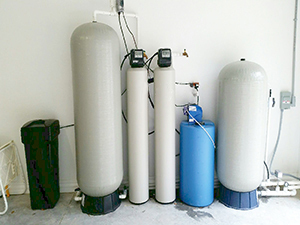 The Water Doctor (“H2O2”) Well Water Treatment System uses a powerful oxidizing agent, even more powerful than aeration, chlorine or potassium permanganate. Hydrogen peroxide decomposes into oxygen and water leaving no trace of chemical residues. For problem well water containing iron, iron bacteria, manganese and/or “rotten-egg” sulfur odor “H2S” (hydrogen sulfide gas) our hydrogen peroxide system is an excellent choice.